Rice bran oil is normally refined by physical method to keep the Oryzanol in the refined oil. In chemical process Oryzanol get destroyed by alkali. 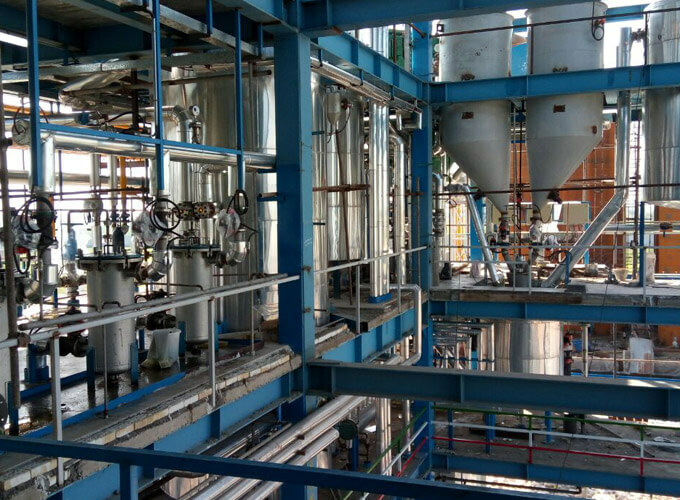 For the physical refining of Rice bran oil following processing steps takes place. Degumming eliminates phospholipids so as to enhance its physical stability. The process is necessary also to facilitate further steps in refining. Phospholipids can treat dark coloured oil and they can also serve as precursors of oil off -flavor. Free fatty acids, pigments and other impurities are also partially removed by degumming. They decompose, and darken the oil because of their thermal instability. Mectech's customized design of bleacher eliminates mechanical agitation. Thus bleaching is achieved optimally in terms of moisture content leading to best results. Saves power consumption for the system. Dewaxing of oil is a process of eliminating higher melting point constituents like waxes or triglycerides from oil by gradually cooling vegetable oils and separating saturated glycerides from the oil. 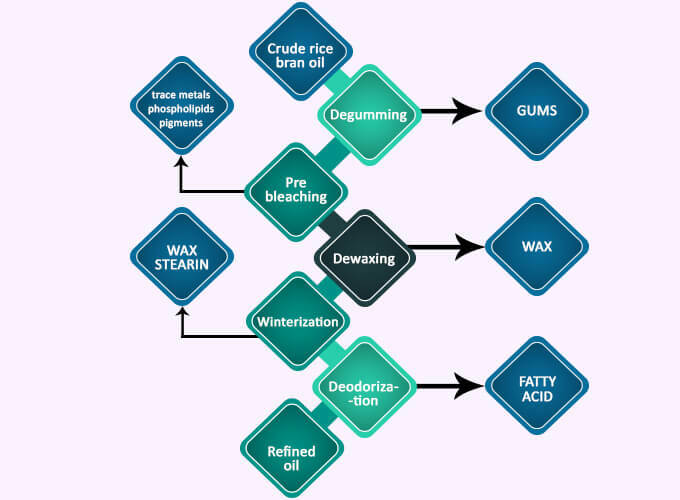 Normally Dewaxing process carried out at higher temperature (18-20 °C) to avoid the crystallization of saturated triglycerides & amalgamation of waxes & saturated triglycerides. 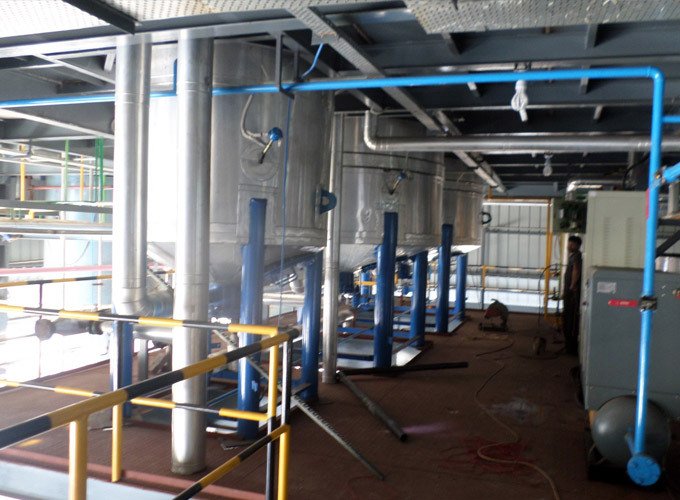 Crystallizer and cooling system designed so efficiently which allows the nucleation even in high temperature. Once the nuclei forms in higher temperature the crystal size became large below equilibrium temperature. 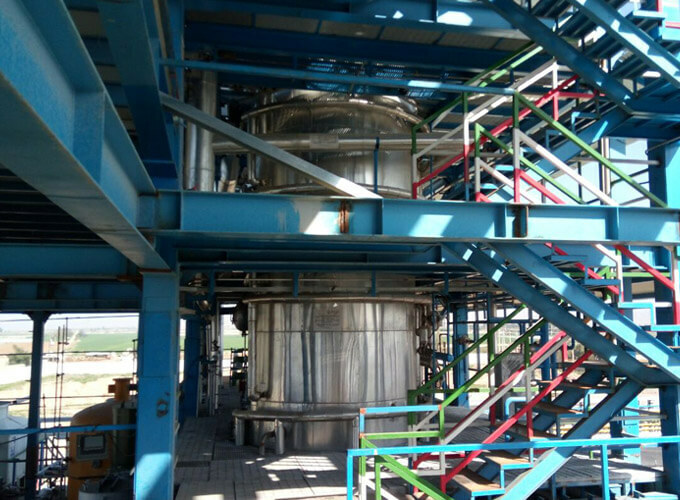 Agitators designing and speed are so special which does not allows mechanical disturbance during the crystallization process. Waxes & Saturated triglycerides which are fairly visible at low temperature are removed in this process to keep the appearance oil clean transform Degummed, Bleached & Dewaxed oil is cooled and filtered to achieve the quality. Post Bleaching process is required the oil colour and phospholipids which were not removed completely in earlier processes. 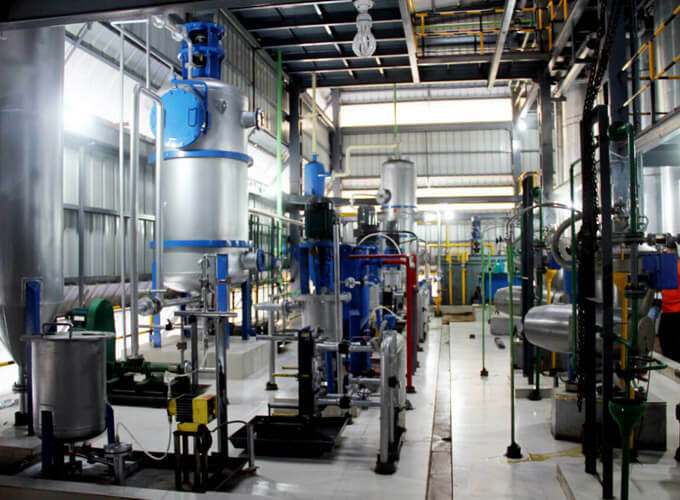 Deodorization achieves vacuum stripping by passing a specific amount of a stripping agent (usually steam) for a specific time through hot oil at low pressure. The mainly a physical process removes various volatile components. Most efficiently designed oil to oil heat exchanger fitted in the tray of Deodorizer ensures minimum heat energy requirement.